Read this if you are tired of litter getting everywhere! I recently tested the PetFusion SmartGrip Cat Litter Mat for my cat and found it to be the best litter mat for my cat and my home, the reason for the immediate conclusion is because of the the price is very affordable extremely easy to clean and does everything it is advertised to do. What is different about the PetFusion SmartGrip kitty Litter Mat, is that the material is soft and picks up moisture like a sponge. My cat loves digging his paws into the soft comfortable material of the mat after he uses his litter box. He loves this mat, and it absorbs all the mess. The mat is a sleek and modern design and is made of flexible material which comes in handy if you need to fold it up and store it. I have it placed currently in my small bathroom of my home, and it looks great. It is more durable and thicker than other cat mats I have previously bought, and there has been no litter residue anywhere except on the mat. The material is environmentally friendly and is free from phthalates and vinyl chloride as well as being PVC material free. The mat comes in different colors, either in gray, sage or beige and the colors are neutral and go well with any decor. The mat is large 35 by 24 inches, so it covers a good span on the floor. The pros to buying this mat is that it is affordable, very absorbent and easy to clean and my cat has show signs of loving it as soon as I introduced it to him. The mat performs very well with multiple cats and keeps the area around the litter box clean with no worries. There is no cons that I can think of with this mat, the only thing better would be if my cat could use the toilet. He is quite defiant and I don’t see that happening anytime soon! Before buying the PetFusion SmartGrip kitty Litter Mat, I tried all types of mats with different litter boxes. 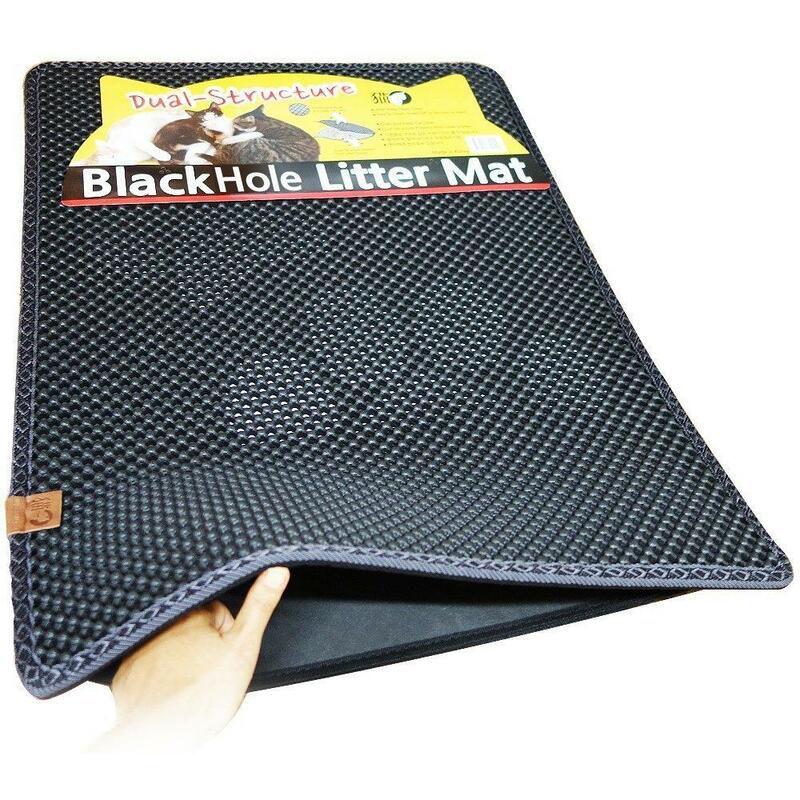 No matter what, litter would get everywhere, and it would be a pain to clean but ever since trying this mat with my cats I have seen nothing but positive results. The Omega Paw with the Smartgrip litter box mat. This is the most affordable and absorbent mat I have seen on the market, and for the mere price of $30,00 (but I got it at a cheaper price seen below) at most retailers you cannot go wrong with this mat and I have a good feeling that the durable material used in this product will last for quite a few years to come. I currently have the mat in gray twist, and plan on ordering another one soon in a different color for another room in my house, just because it is so affordable and convenient. I think this is a great mat for someone who has one or multiple cats. I love the soft material and how large the mat is. My cat has been using the litter box every time and it makes me happy to see how comfortable with this mat feels to touch. He loves digging his paws in the soft material, and I love how easy this is to clean. This was a great buy for the price, and I am amazed after having this mat for six months it still looks brand new. This is of a high quality material, and it is much softer and more absorbent than any mat I have seen on the market. I am very happy with this mat. I have never used amazon, what if I dont receive it? Hi, Brad if you dont recieve your items then you can always contact amazons support network and they will promptly help you. Amazon has a great reputation with their customer service. I would personally doubt you would have issues getting your item.